Marie Magdelaine Monmellian dit Saint Germain, wife of Jean Pierre David dit Saint Michel, was born on 04 April 1698 in Quebec City, Nouvelle France to Jean Baptiste Monmellian dit Saint Germain and Marie Helene Juneau Journeau). Her godparents were Jacques Queyla, a tailor by profession, and Marie Madeleine Richausme. Fre Francois Dupre, priest and resident of Quebec, presided at her baptism. in the Parish of Notre Dame de Quebec, oldest parish in North America, at the Notre-Dame de Quebec basilica-cathedral, Originally built in 1647. Marie Magdelaine's paternal grandparents were Jacques Monmellian and Claudine Guilet of the Parish of Saint-Sulpice, Paris, France located in the Saint Germain district which may have been the source from which her families' name dit Saint Germain was derived. Her maternal grandparents were Jean Jouineau and Marie Anne Videau Delagassonnerie of the Parish of Notre Dame de Cogne in La Rochelle, France. Marie Magdelaine was the 7th child and 3rd daughter of a family of 8 children that included 4 boys and 4 girls. From numerous Archives of Louisbourg source records, it appears that her younger sister by 5 years, Genevieve Monmellian dit Saint Germain, was a close sibling and would follow Marie Magdelaine for many years from Quebec City to the Fortress of Louisbourg. Note: The spelling of Marie Magdelaine Monmellian's name appears throughout uncovered primary source records in numerous variations. Her given name appears as Marie Magdelaine, Marie Magdeleine and Marie Madeleine. In addition, there are 17 different spellings for the Monmellian surname in the Quebec City church records. In the 18th century, spelling was often phonetic and occasionally creative. The Records Archivists made the decision to use "Monmellian" as the only valid field entry for this surname in their PRDH (Le Programme de recherche en demographie historique) database. Virtually nothing is yet known of Marie Magdelaine's infant, adolescent and young adult years in Quebec City. However, her marriage to Jean Pierre appears to have taken place sometimes after the Quebec 1716 Census which lists Marie Magdelaine as single at the age of 18 and living with her parents. 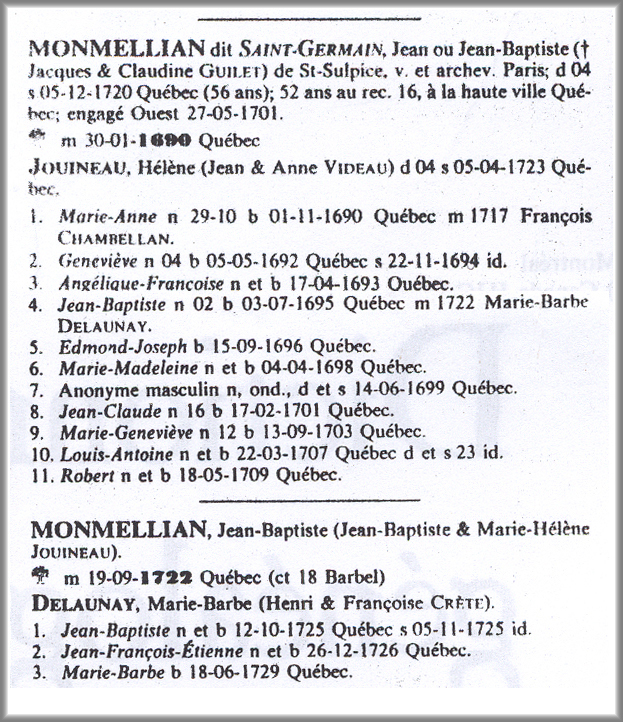 From all indications, Jean Pierre’s marriage to Marie Magdelaine occurred about 1717, sometimes shortly after the Quebec 1716 Census and the birth of Jean and Marie's 1st child about 1718. The actual date and place of their marriage is unknown at this time, however, the location of the marriage would probably have been somewhere between Québec City and the township of Louisbourg on the northern coast of Cape Brenton Island (Île Royale). As is a traditional Catholic marital custom often practiced at that time as well as current times, there exists the very likely possibility that Jean and Marie were married in the same church in which Marie was baptized in 1698, Notre-Dame de Quebec Basilica-Cathedral. Between 1718 and 1722, Marie Magdelaine gave birth to her 1st 3 children, Pierre about 1718, Michel about 1720 and Magdeleine about 1721. The exact date and place of their births is yet unknown, however, it is highly likely that they were born somewhere between Quebec City, Acadie or at the Fortress of Louisbourg. The 1st primary source record which documents Marie Magdelaine's presence at Louisbourg is the birth of her and Jean Pierre's 2nd daughter and 4th child, Marie Josephe, on 08 November 1722. By 1722, Jean Pierre and Marie Magdelaine had now arrived and established their home at the Fortress of Louisbourg. There, the family continued to prosper and grow with the births of 2 additional children, Jean Jacques on 19 June 1724 and Jean Baptiste on 22 July 1725. 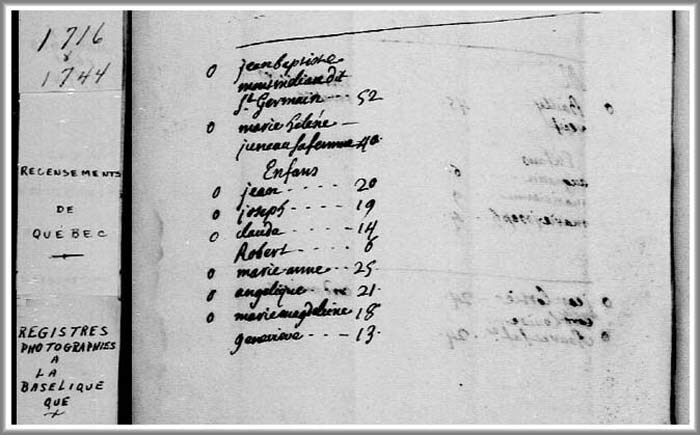 Marie Magdelaine's presence in Louisbourg is indirectly recorded in the Louisbourg 1724 Census which lists her husband, Jean David dit Saint Michel of Nantes, a blacksmith, a wife (Marie Magdelaine), 3 sons under 15, (Pierre, Michel and Jean Jacques) and 2 daughters (Magdeleine and Marie Josephe). In addition, the Louisbourg 1726 Census which also indirectly includes Marie Magdelaine continues to coincide with the Louisbourg 1724 Census with the family addition of Jean Pierre and Marie Magdelaine's son, Jean Baptiste David, in 1725. Between the Louisbourg Census of 1726 and 1734, the births of 4 more children blessed the David dit Saint Michel household, Francois on 16 June 1727, , Francoise Charlotte on 10 April 1729 , Etienne Thomas on 21 December 1730 and Louis on 02 September 1732. Unfortunately, along with this joy came much sorrow. For during this period, Jean and Marie tragically buried 3 of their children wirh the deaths of Pierre on 30 January 1730 at the age of 11 years , Magdeleine on 09 February 1733 at the age of 12 and Etienne Thomas on 01 April 1733 at the infant age of 2 years . The Louisbourg 1734 Census seems to account for all surviving family members at that time. It also lists Jean David dit Saint Michel of Nantes, a blacksmith, his wife, Marie Magdelaine Monmellian, 4 sons under 15, who would have been Jean Jacque, Jean Baptiste, Francois and Louis, and 2 daughters, who would have been, Marie Josephe and Francoise Charlotte. In 1734, their 2nd son, Michel would have been at least 15 years of age or older and for that reason was possibly not included in this census. The last 5 of Marie and Jean's children to be born at Louisbourg were Claude Thomas born on 20 December 1735, Jacques Andre born on 30 November 1737, Jeanne Olive born on 10 July 1739, Marie Magdeleine born on 16 January 1741 and Jeanne Angelique born on 21 December 1743. According to the Fortress of Louisbourg Historical Memoranda Series 1964 to Present H F 25 1989 titled Jean Pierre David dit Saint Michel: Blacksmith authored by Eric Krause of Krause House Info-Research Solutions, Jean Pierre and Marie Magdelaine were still living at Louisbourg in 1744 along with their surviving children of "5 boys for certain, possibly 6 and 5 girls." These children would probably have included their sons Jean Jacques, Jean Baptiste, Francois, Louis, Claude Thomas and Jacques Andre and their daughters Marie Josephe, Francoise Charlotte, Jeanne Olive, Marie Magdeleine and Jeanne Angelique. The "possibly 6" son referred to was probably Michel who married Genevieve Hebert on 20 January 1744 in Grand-Pré, Acadie and was probably living there with his wife. During this period between 1745 and 1748, it is unknown where 5 of Jean Pierre and Marie Magdelaine's children may have spent these years. It is highly likely that Michel, having just been married in 1744, may have been in Grand-Pré, Acadie with his new wife, Genevieve Hebert. However, the whereabouts of Marie Josephe, Francois, Jacques Andre and Jeanne Angelique during this period are unknown. 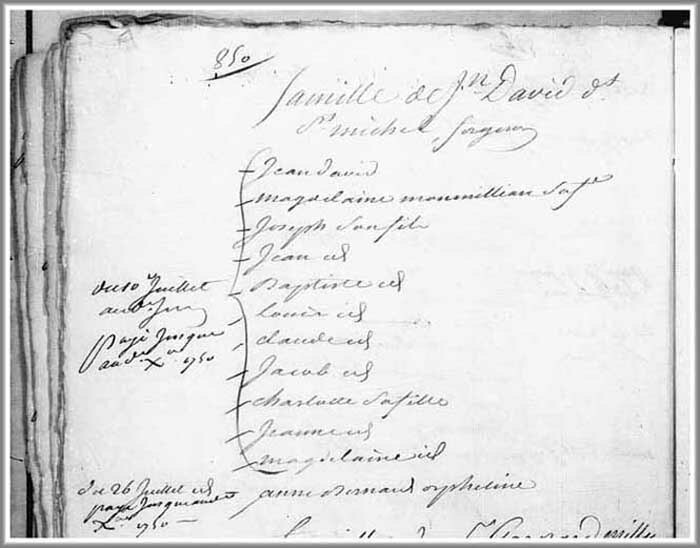 The Family Reconsturction File based on the Louisbourg 1749-1750 Census indicates that these 5 children did not return with Jean Pierre and Marie Magdelaine when they were repatriated to Louisbourg in 1748 from their exile. 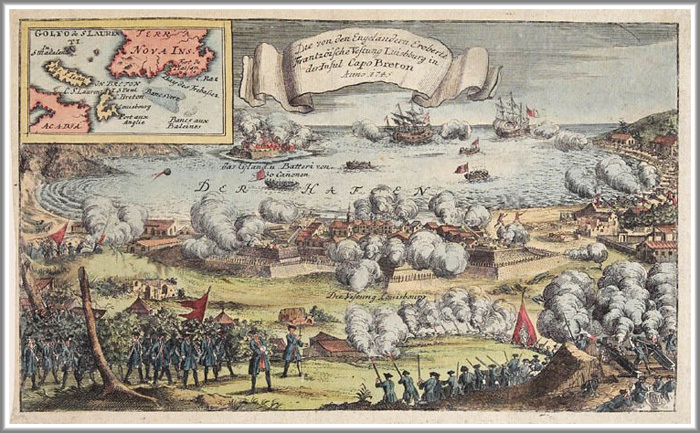 No records of the David family's life between 1745 and 1748 has been yet uncovered after the 1st seige of the Fortress at Louisbourg by the British in 1745. The records of their lives pick up once again with the Louisbourg 1749-1750 Census and the marriage of Marie Josephe to Jean Paul Pouilly on 1 June 1751 at Louisbourg. Their exile from Louisbourg did not deter Jean Pierre and Marie Magdelaine from continuing to grow their family. For when they returned to the Fortress in 1749 they did so with 2 new boys, Joseph and Jacob, along with an adopted daughter, Anne Bernard. Anne Bernard was adopted by Jean Pierre and Marie Magdelaine between 1745 and 1749 during their exile from Louisbourg after the 1st siege of Fortress of Louisbourg in 1745. When Jean Pierre and Marie Magdelaine returned to Louisbourg in 1749, they did so with 9 children and an orphan. These included 2 new sons, Joseph and Jacobs, who apparently were born during the 4 years of their exile, and an orphan by the name of Anne Bernard. According to the Louisbourg Census of 1749-1750, it appears that the other (7) children returning to Louisbourg from exile were Jean Jacques, Jean Baptiste, Louis, Claude Thomas, Francoise Charlotte, Jeanne Olive and Marie Magdeleine. On 1 February 1755, at the age of 57 years, Marie Magdelaine Monmellian, Jean Pierre's wife, who had shared his life for 38 years and who had born him 17 children, died and was buried in the Cemetery of Louisbourg. Fre Julien Moisson presided at her burial. The cause of her death is yet unknown. Her death record indicates she was "age of about sixty years" when she died, however, her actual age from her date of birth to her date of death was exactly 57 years and 27 days. Although Marie Magdelaine died at a relatively young age, she lead a very full life that was centered on her child bearing years spaning from about 1718 at the age of 20 years with the birth of her 1st child until the birth of her 16th and 17th child between 1745 to 1749 at the age of 46 to 50 years. Marie Magdelaine's documented presence in Louisbourg is recorded in a Family Reconstitution File of her husband, Jean Pierre David, which is archived at the Fortress of Louisbourg National Historic Site of Canada. This Family Reconstitution File was abstracted and compiled from original source documents archived at the Archives of Canadian and the Archives Nationale in France. Further documented evidence which notates Marie Magdelaine in Louisbourg during this period has been extracted and compiled from original source documents into the Fortress of Louisbourg Historical Memoranda Series 1964 to Present H F 25 1989 titled Jean Pierre David dit Saint Michel: Blacksmith authored by Eric Krause of Krause House Info-Research Solutions. 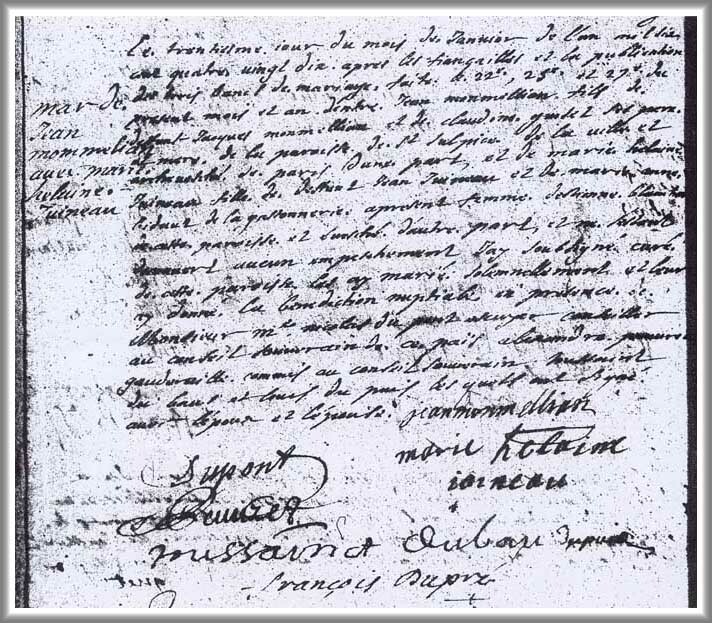 Marie Magdelaine's only primary source recorded godchild uncovered to date was (Name Unknown) Lopinel, born the child of Joseph Lopinel, blacksmith and soldier of the company M. Dangeac and Genevieve Monmellian on 30 June 1723 in Louisbourg and baptized the same day. Sieur Pontarly was recorded as the child's godfather and Marie Magdelaine Monenillan was recorded as godmother and aunt maternal of the enfant. Fre Claude Sanquer (Miss. R. and VG) presided at this baptism. Witness attending the baptism was Isabelle Marie. Marie Magdelaine's father was Jean Baptiste Monmellian dit Saint Germain, born about 1664 in Paris, France and was baptized in the Parish of Saint-Sulpice. He died on 04 April 1720 in Quebec at the age of 56. Her mother was Marie Helene Juineau (Journeau), born 24 Dec 1665 in Quebec City, Nouvelle France, and died 04 April 1723 in the same city of her birth. 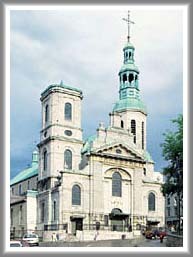 Jean Baptiste and Marie Helene were married on 30 January 1690 in the Parish of Notre Dame de Quebec at the Notre-Dame de Quebec basilica-cathedral. According to the secondary source abstracts, Marie Magdelaine's paternal grandparents were Jacques Monmellian and Claudine Guilet of the Parish of Saint-Sulpice, Paris, France and her maternal grandparents were Jean Jouineau and Marie Anne Videau Delagassonnerie of the Parish of Notre Dame de Cogne in La Rochelle, France. Marie Magdelaine married Jean Pierre David dit Saint Michel, born about 1695 in Nantes, Province of Brittany, France. It is believed they were married about 1717 at the Notre-Dame de Quebec basilica-cathedral, Parish of Notre Dame de Quebec. It is also believed that Jean Pierre may have died during his deportation oyage from the Fortress of Louisbourg that landed at La Rochelle, France by 28 April 1759 after the 2nd and final siege of the Fortress by the British in 1758. 14. Marie Magdeleine, a daughter born on 17 January 1741 at the Fortress of Louisbourg. She died on 30 January 1752 at the Fortress of Louisbourg. 18. Ann Bernard, a daughter adopted between 1745 and 1749 in France. The date and place of her birth and death is unknown at this time.